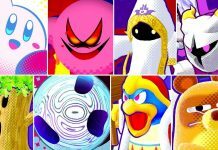 These are all of the new Secret Mural Paintings In Kirby Star Allies including the DLC characters. I really love HAL for adding so much content to the game, it's really amazes me. So they can be found in story mode! Kirby Kirby Kirby is a name you should know Kirby Kirby Kirby he's the star of the show. So is that how you unlock Gooey and Marx and things?